Air India Recruitment Department is going to recruit fresher candidates for the various vacant job profiles in the various airport in India. AIATSL (Air India Air Transport Services Limited) is inviting all Indian candidates for this Air India Career making opportunity. Government job applications from all Indian Nationals (Male & Female) who meet with the all the eligibility criteria which we explained below for various post can apply for this Air India Vacancy 2018. The number of vacancies under this Air India recruitment process are indicative and reservation will be as per the Presidential Directives. The actual reservation of vacancies would depend upon the prevailing strength at the time of appointment. More information about these Government jobs in Air India is given below in this article. 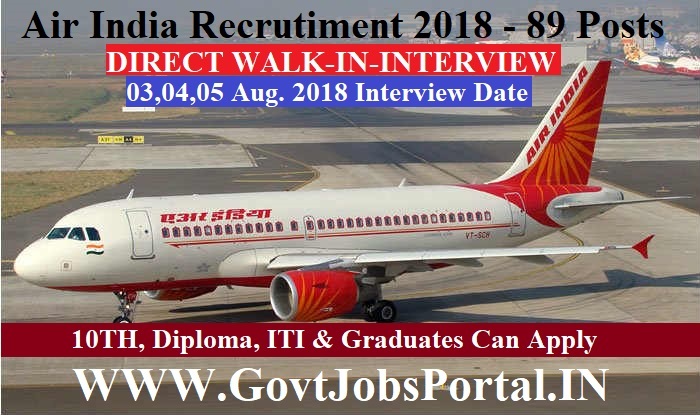 Read the whole article carefully before applying this Air India recruitment 2018. What are the Eligibility Criteria for AIR INDIA Recruitment? Graduate +1 YEAR experience in Passenger Handling at Airports. 3 years diploma in following trades: “Mechanical/ Electrical / Production / Electronics/ Automobile Engineering”. ITI in following trades: “motor vehicle / Auto Electrical / Air Conditioning / Diesel Mechanic / Bench fitter / Welder. What is the application Fee for applying this Air India Recruitment? You can pay through the Demand Draft in favour of “AIR INDIA AIR TRANSPORT SERVICES LTD.”, payable at Mumbai. What is the process for applying this Air India Recruitment? Air India is inviting all Indian candidates for direct interview round along with the application form. The prescribed application form is attached with the Advertisement below given under IMPORTANT LINK section. Download the application form and fill up with your detail. 03rd , 4th , 5th Aug. 2018 is the date of interview.